Obstacle to Peace shatters mainstream propaganda narratives about the conflict, revealing the true reasons for its persistence and illuminating the path forward to a just resolution. What is the root cause of the conflict between Israelis and Palestinans? Why has it persisted for so long? How can peace and justice finally be realized? T here’s a widespread misconception that the conflict between Israelis and Palestinians is too complicated to resolve. The world witnesses the routine violence, and a sense of hopelessness prevails. News consumers trying to understand what’s happening struggle to make sense of conflicting information. Many watching events unfold wish for peace, but resign themselves to the belief that there’s nothing they can do about it. How can I distinguish truth from deceptive propaganda? What sources can I trust? How can I quickly gain an in-depth understanding of this issue without having to spend years researching? How can the momentum of the established political order that’s maintaining the status quo be overcome? What can I do to help make a difference? How can I gain the knowledge and confidence to speak out and become an effective voice for peace? 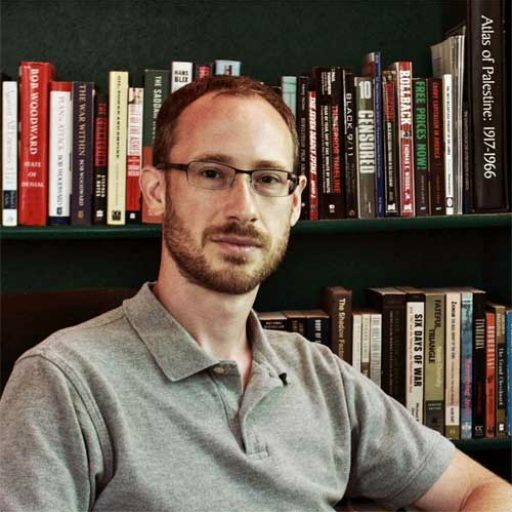 My name is Jeremy R. Hammond, and I’d like to share with you briefly the story about why I wrote the book Obstacle to Peace: The US Role in the Israeli-Palestinian Conflict. In the summer of 2008, the government of Israel came to a ceasefire agreement with the Palestinian organization ruling the Gaza Strip, Hamas. As an independent journalist and political analyst, I was observing the situation, and it soon became evident that the ceasefire would not hold. I wrote on my blog that it would end with Israel launching a military operation in Gaza. On December 27, that prediction came true as Israel launched “Operation Cast Lead”. I continued to pay close attention to what was happening in Gaza during this 22-day assault, and wrote about it on my blog and at Foreign Policy Journal, an online publication I had founded shortly prior, in the fall of 2008. I subsequently received a Project Censored Award for writing about how the US government was supporting Israel’s assault — and what amounted to war crimes against the civilian population of Palestine. I was also struck by just how blatantly the US mainstream media was deceiving the public about what was happening. I observed, for example, how the New York Times told the public that Israel launched this operation in self-defense after suffering ceaseless rocket attacks from Hamas, even though it was Israel that had violated the ceasefire. Indeed, the Times had initially reported Israel’s violation of the ceasefire, but subsequently omitted this fact from its accounts of how the violence began! Appalled by the sheer magnitude of the lies and deceptions the public was being told by the government and media, I became determined to write a book to document what really happened and set the record straight. However, I didn’t just want to tell the story of what happened during Operation Cast Lead. I wanted to help people see the bigger picture by covering the whole spectrum of issues. I wanted to tell the story of why the conflict has gone on for so long, to identify the primary obstacle to peace and assess how to overcome it. Unsatisfied with the Bush administration’s answer that it was because “they hate our freedom”, I began spending a lot of time researching, and my inquiries naturally led me to focus on US policy in the Middle East and, particularly, toward Israel and Palestine. It quickly became obvious that one of the main reasons the Palestinians continue to suffer under Israel’s occupation regime is because its policies are supported by the government of the United States of America. One question I struggled with, though, is how this was able to go on. How could the international community be so impotent in the face of such injustice, at best; or, worse, complicit in the wholesale violation of Palestinians’ rights? How could the American people stand by and consent to their government’s policy of supporting Israel’s violations of international law and human rights abuses? I initially assumed that people just didn’t care or were uninformed about the plight of the Palestinians. But the more I studied, the more I realized that the problem is not that most people are uniformed; it’s that they are so greatly mis-informed. It’s not that people don’t know enough about the Israeli-Palestinian conflict, but that so much of what they think they know just isn’t true. This is certainly true for most Americans, who are continually inundated with propaganda narratives that, far from properly informing about thee true nature of the conflict, serves to manufacture their consent for US government policies aimed at sustaining the unacceptable status quo. The official narratives propagated by the government and mainstream media during Operation Cast Lead were certainly no exception. However, to tell the story of why the conflict persists today, I would also need to explain its root causes. So I splintered my book idea and in 2009 published a short book titled The Rejection of Palestinian Self-Determination: The Struggle for Palestine and the Roots of the Israeli-Arab Conflict. It was two more years before I finally set out writing the book I originally had in mind after Operation Cast lead. It was May 2011, and President Barack Obama had given a speech outlining US policy. Once again, the media got it entirely wrong. The basic narrative was that Obama was more sympathetic toward the Palestinians than previous presidents and was pressuring Israel to freeze construction of Jewish settlements in the occupied West Bank. The scarcely concealed reality was that, meaningless rhetoric aside, Obama was fully supportive of Israel’s policies and arguably more so than any previous president. This included supporting Israel’s settlement policies by demanding that the Palestinians negotiate with Israel “without preconditions”, meaning without a cessation of Israel’s illegal expansion of Jewish settlements! Compelled to set the record straight, I began writing in earnest. I originally intended to submit my manuscript to publishers and hope one of them was interested in it. But I had also already self-published a book and kept this option in mind. Then, in 2012, as candidates were campaigning for the presidential election, I took a break from my work on the manuscript. There was another story that I was compelled to tell in order to combat the dominating propaganda narrative at the time that the cause of the US housing bubble and the financial crisis it precipitated was an overabundance of liberty in the marketplace. To bust apart this statist nonsense, I took two weeks to write and two to publish the book Ron Paul vs. Paul Krugman: Austrian vs. Keynesian Economics in the Financial Crisis, which shows how the fundamental cause of the bubble was the Federal Reserve’s inflationary monetary policy. In addition to telling an important story that needed to be told, it was a bit of an experiment for me that would help me determine how I would publish my book on the US role in the Israeli-Palestinian conflict. Without spending a dime on marketing or advertising, my book on the housing bubble ended up getting a rave review in the Wall Street Journal-owned financial weekly Barron’s. Economics and books editor Gene Epstein described me as a “writer of rare skill” who had, in fewer than 100 pages, conveyed “more insight into the causes and cures of business cycles than most textbooks” while also making you laugh, qualifying it as a “must-read”. That experience convinced me that I could get my message out there by publishing my own work, and I decided I would start my own imprint to publish my magnum opus on the Israeli-Palestinian conflict. So that’s what I did! Another outcome from that experience was that I befriended Mr. Epstein, who also shared a deep interest in the Israeli-Palestinian conflict and ended up writing the Introduction to Obstacle to Peace. It was a project that took several more years to complete — a struggle, I can tell you, since during that time my wife and I also had a son and moved halfway around the world, leaving jobs behind to start a new chapter in our life’s adventure (again, a whole other story)! 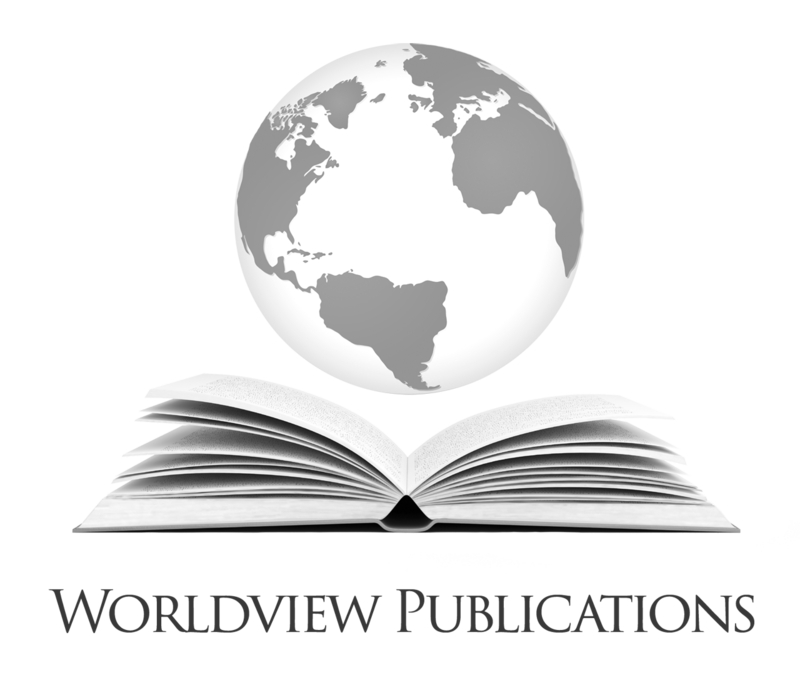 But I persevered, and the result was Obstacle to Peace, published in July 2016 by my imprint, Worldview Publications. Obstacle to Peace focuses primarily on events since the beginning of the so-called “peace process” through to the UN’s recognition of Palestine as a non-member state in 2012, while also presenting earlier historical context as necessary to understand why the conflict persists today. It tells the story of how Israel and its superpower benefactor have long blocked implementation of the two-state solution, and how they have partnered to violently suppress Palestinian resistance to the occupation regime. It also tells the story of how the US mainstream media—with a special focus on The New York Times—has effectively served the role of manufacturing consent for the US government’s policy of supporting Israel’s crimes against the Palestinians by systematically misinforming the American public about the true nature of the conflict. Obstacle to Peace shatters mainstream propaganda narratives about the conflict, revealing the true reasons for its persistence and illuminating the path to a just peace. How Israeli (and US) policies have strengthened Hamas, discouraged the group’s evolution toward non-violence, and deliberately provoked violent responses from Hamas and other armed groups in order to serve as a pretext for Israel to continue its oppressive occupation and settlement regime. Why Israel has implemented an illegal policy of collectively punishing the civilian population of Gaza, and how it’s been able to do so with impunity for over a decade. Why Israel really launched Operation Cast Lead (2008-2009) and Operation Pillar of Defense (2012), and how they amounted to military assaults on the defenseless civilian population of the Gaza Strip. What the so-called “peace process” is, and how Israel and the US have always used it to maintain the status quo of occupation. What “the two-state solution” really is, and how it differs dramatically from the goal of the US-led “peace process”. Why Israel on May 31, 2010, attacked the humanitarian Freedom Flotilla that sought to break the illegal Israeli blockade of Gaza, and why the US defended Israel’s killing of 9 peace activists on board the Mavi Marmara while the ship was still in international waters. What must happen in order for the Palestinians to gain their freedom from Israel’s oppressive occupation regime, as well as for there to be a realistic hope of Palestinian refugees ever being able to return to their homeland in what is today Israel. How and why the mainstream media’s reporting on the conflict is so grossly distorted, effectively serving the role of manufacturing consent for the US policy of supporting Israel’s crimes against the Palestinians. How to decipher the euphemistic language used by government officials and the media to deceive the public. How the UN helped create the conflict, and how Secretary-General Ban Ki-moon played a duplicitous role, serving Israel and the US rather than the principles enshrined in the UN Charter and international law. What the UN Goldstone Report was, what its findings and recommendations were, the true reasons why it so upset Israel and the US, and why their claims that the report has been debunked and retracted are utterly false. How, despite expressing rhetorical support for a two-state solution and criticizing Israeli settlements, the US under President Barack Obama continued the longstanding policy of previous administrations of supporting Israel’s efforts to prevent them from exercising their rights. Who Should Read Obstacle to Peace? Close-minded individuals who are unwilling to question their underlying beliefs about the conflict and who are impervious to facts and reason. You are a concerned citizen of the world who cares about this issue, but feel confused by all the conflicting information and would like to truly understand what the conflict is all about and why it persists. You are already well-read about the subject and are seeking a fresh perspective and valuable new insights. You are active in the struggle for peace and justice and would like to empower yourself with the knowledge to become an effective voice for peace. You are a journalist or blogger with an intense desire to educate yourself about this subject and share knowledge with others. You are an academic seeking scholarly, fully referenced resources on this subject. You are a policymaker or other person of influence who recognizes that US policy must change if there is to be any hope of peace. Obstacle to Peace features a Foreword by Richard Falk, professor emeritus at Princeton University and former UN Special Rapporteur on the situation of human rights in the occupied Palestinian territories. Mr. Falk explains why Obstacle to Peace is an important contribution to the literature on the Israel-Palestine conflict. It also features an Introduction by Gene Epstein, former economics and books editor at Barron’s, the financial weekly. As Mr. Epstein explains, “people who would benefit most from reading his book will put up a wall of resistance against the simple facts, plain arguments, and common sense he offers.” He urges readers whose only familiarity with the conflict is what they’ve been told by the government and media to be willing to keep and open mind and question the beliefs they’ve come to hold. Obstacle to Peace is 538 pages of hard-hitting and meticulously documented analysis, with 68 pages of endnote references. It also contains a thorough index, making it an invaluable resource for researchers and activists. It’s available in hardcover, paperback, Kindle, or ePub editions. Author of "Fateful Triangle: The United States, Israel & The Palestinians"
Everybody’s gotta read Obstacle to Peace: The US Role in the Israeli-Palestinian Conflict by Jeremy Hammond. It’s great! … It’s such an important book…. This is really the book I’ve been waiting for a long time to read. Author of "Goliath: Life and Loathing in Greater Israel"
Associate Professor of English at Virginia Tech and author of six books, including "Israel’s Dead Soul" and "The Holy Land in Transit: Colonialism and the Quest for Canaan"
Former Swedish diplomat and author of "Crimes, Victims and Witnesses: Apartheid in Palestine"
Author of "Imperial Designs: War, Humiliation and the Making of History"
Author of "Fault Lines: The Layman’s Guide to Understanding America’s Role in the Ever-Changing Middle East"
This book is a tour de force. Hammond’s rich, fact-based analysis extends well beyond platitudes to a deep integration of historical and contemporary research based on sources that could hardly be disputed. This articulate volume shows in well-documented detail how the US has colluded with Israel in blocking peace with the Palestinians…. Hammond is a resourceful journalist who uncovers important facts previously undisclosed by a biased mainstream media. I have been a serious student of this issue since 1967. I have read nearly every book available on the subject from all sides. 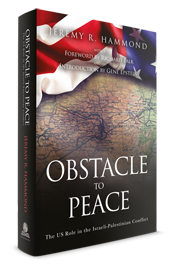 Obstacle To Peace by Jeremy R. Hammond is one of the very best books out there for giving people a very clear and concise understanding of why, when both sides say they want peace, after all these years there is no peace…. Kudos, Mr. Hammond. A brave and much needed effort. Hammond’s style and his extensive use of direct, contextualized quotations is delightful even when the content itself is infuriating. Before reading this book, I already had an extensive knowledge of [the subject] up to Oslo, but it was not necessarily required to enjoy the book, as Hammond takes time to give more than adequate historical context whenever it is needed. This book makes an excellent companion to Mearsheimer and Walt’s “The Israel Lobby” and Neil Caplan’s “Contested Histories”. Very good book; thoroughly researched, and factual; provides a solid refutation to much of the biased, inaccurate, and blatant propaganda that the western media has offered. Very well researched and a must read for anyone wanting to know what transpired in Palestine over the last 150 years. Mr Hammond has destroyed every Zionist argument with this thoroughly researched and cogently argued book…. If Americans understood the truth, they would not stand for Washington’s policies for a second. The world would be a better safer place for everyone. I hope millions read this fine book. Stunning information. It is … shocking, an eye opener to problems between Israel & Palestine and the U.S. role in it. A must read. A great book. Gives a detailed description looking from the “other side” of the Israel-Palestine conflict. The detail, both verbal and numerical, is massive. Extensive references to back up the facts quoted. I believe that anyone wishing to understand this conflict would benefit from reading this book. I am a Jewish student at the University of Oregon and a political science major with an strong interest in the Israel/Palestine conflict. After 3 years studying this issue I was so please to find “Obstacle to Peace”. Well written with lots of data that can easily be checked. This book has helped me in discussions with other students, to bring forth the real events and how they played out. Excellent read! Full of facts that most Americans are not aware of! Get All of My Books for One Low Price! That’s a value of $81.89 for the hardcover bundle (or $66.89 for the paperback). With my bundle deal, your copy of Obstacle to Peace will be signed at no extra cost, plus you’ll get the PDF editions of The Rejection of Palestinian Self-Determination and Ron Paul vs. Paul Krugman for free. That brings us down to $73.59 for the hardcover bundle (or $58.59 for the paperback). But you won’t pay that price, either! See, by buying my books directly from me rather than from a retailer, there is a cost savings, which allows me to return some of that savings (like the 50% industry standard wholesale discount!) back to you! So I’ve made this book bundle available for just $65 for the hardcover (or $54 for the paperback). Want to start reading it now for free? 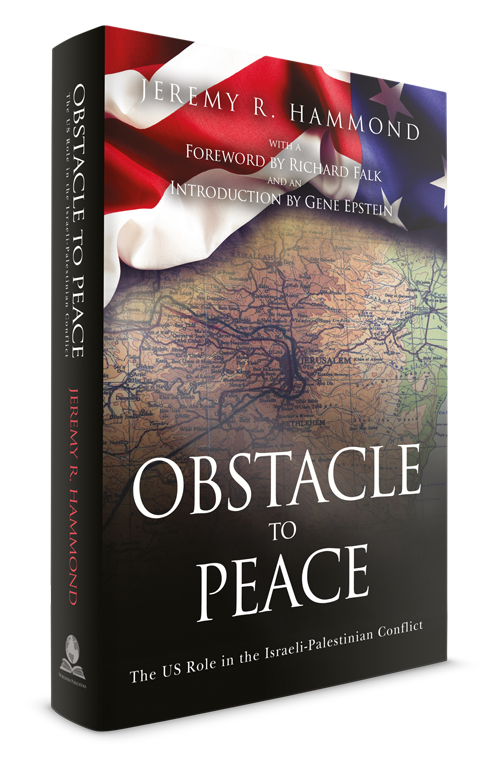 Subscribe to Jeremy R. Hammond's newsletter, plus download the entire first chapter of Obstacle to Peace for free. Yes, send me the chapter! 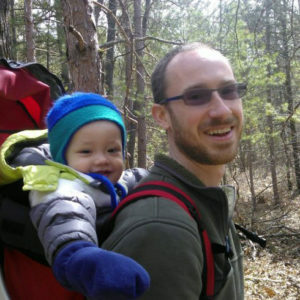 Enter your name and email below to stay updated with Jeremy R. Hammond's writings on the Palestine conflict, plus download the entire first chapter of Obstacle to Peace for free.